Dwelling coverage refers to the coverage in your basic HO3 (homeowners) policy that covers your home, or in insurance lingo, dwelling. This coverage protects your home you live in, plus any attached structures (your garage, for example), from perils listed in your insurance policy. Some of these include vandalism, theft, windstorms, and more. Should you file a claim for damage by any of the listed perils, your homeowners insurance may help cover the costs to repair your home or rebuild it. BTW: if your deck or porch is attached to your home, they may also be considered a part of your dwelling, and may also be covered by the dwelling coverage in your homeowners insurance policy. How much dwelling coverage do you need? This is the million dollar question (maybe literally!). How much dwelling coverage do you need? When it comes to setting a dwelling coverage amount for your home, you don’t want to choose the purchase price or current market value. This amount should be the amount that it’d take to rebuild your home (as it was before it needed to be rebuilt – no upgrades! 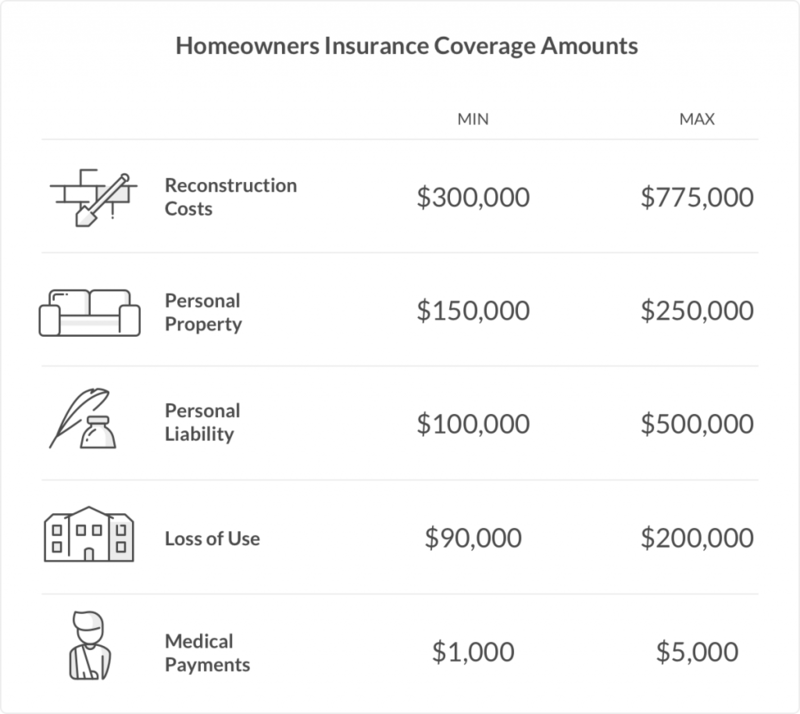 ), known as “reconstruction costs.” This is, after all, what your insurance company will be reimbursing you in the worst case scenario that you have to rebuild. But that’s just your home. There are also all of the other coverages (personal liability, loss of use, etc.) to take into account as well. To price out your personal property, most experts will say you should choose a limit between 50% – 75% of your dwelling coverage amount. If you think this isn’t enough to cover all of your stuff – say you have fine art, lots of expensive jewelry, a collection, or other valuable items – look into the Extra Coverage option with your insurer. Extra Coverage also provides additional coverage in general, so it’d definitely be something to look into. Similarly to personal property, additional expenses, or loss of use, is also based off of dwelling coverage. Most advise to choose an amount that’s around 20-30% of your dwelling coverage. Also, take your lifestyle into consideration, as this covers what you’d usually spend on stuff like food, temporary storage of property, moving costs, etc. So let’s say you eat takeout everyday – breakfast, lunch, and dinner, you’ll most likely want to select an amount that’s more than someone who buys groceries and prepares their meals. Take a look at our ultimate homeowners guide. Why Buy Renters Insurance Online?